In April, vintner Sal D’Angelo, the owner of D’Angelo Estate Winery on the Naramata Bench, will release four of the best red wines he has made so far in British Columbia. Unlabelled samples arrived last month because the wines will be launched with redesigned labels. I expect the labels will be interesting but what is inside the bottles is what really counts. Sal is an interesting man, if only because he operates a winery in Ontario as well. He opened his Okanagan winery in 2007 on a vineyard just north of Penticton and beside the Kettle Valley hiking and cycling trail. The winery also operates a popular bed and breakfast. One reason it is popular is that five or six other wineries are within walking distance. Here is an excerpt from the winery profile in the current edition of John Schreiner’s Okanagan Wine Tour Guide. 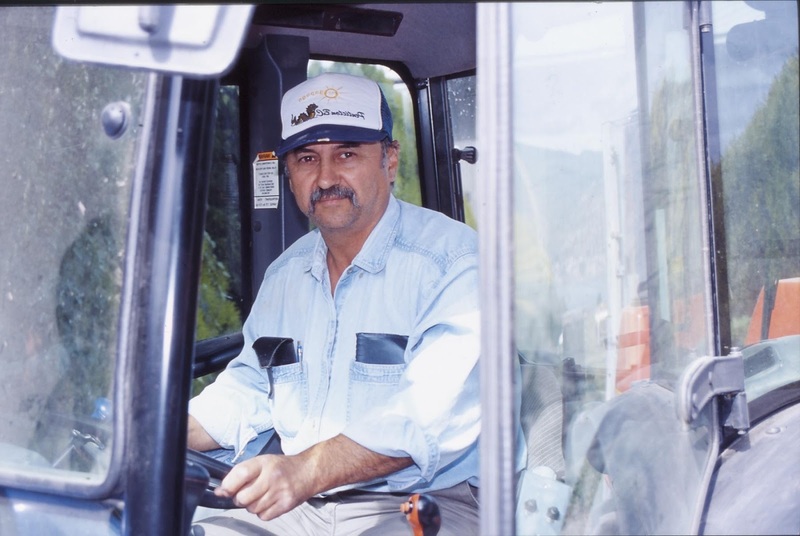 Sal D’Angelo, who runs a winery (also called D’Angelo) near Windsor in Ontario, which opened in 1989, has been attracted to the Naramata Bench since he started vacationing here in the early 1990s. He has a rare condition of the nervous system called Guillan-Barré Syndrome, which is far less trying in the dry Okanagan than in humid southern Ontario. Not that he has ever let the condition hold him back: during one four-hour medical treatment some years ago, he landed a $1,100 wine order from the doctor. Born in Italy in 1953, Sal grew up in Canada in an immigrant home where his family made wine each fall. “I grew up with the smell of fermenting grapes,” he says. He became a science teacher but began to plant grapes in 1983 in his Windsor-area property, opening a winery six years later. During an early Naramata vacation, he presented one of his Ontario reds to Hillside Cellars founder Vera Klokocka with the cocky assertion that the Okanagan was not suited to growing big reds. She produced a Cabernet Sauvignon (she was the first in the Okanagan to make this varietal). Sal changed his mind and starting considering the Okanagan. Since 2001, Sal has acquired an entire peninsula on the eastern bluffs above Lake Okanagan, only minutes north of Penticton. He planted about three hectares (7.4 acres) initially, with room to triple his plantings. Not afraid to be original, Sal was the first in the Okanagan to plant Tempranillo, the leading red variety in Spain. He also planted red Bordeaux varieties and some Pinot Noir and intends to add Viognier, Sauvignon Blanc and Chenin Blanc. If there was any lingering doubt about the Okanagan’s suitability for big reds, these four samples from the winery certainly dispel it. No doubt, it helps that three are from the 2009 vintage and one from 2007, two of the best vintages in the last decade in the Okanagan. D’Angelo Pinot Noir Riserva 2009: This has yet to be priced. Sal has been tasting it against other Pinot Noirs priced anywhere from $25 to $50, trying to settle on a benchmark. I am betting the price will end up around $35, similar to most of the other Naramata Bench Pinot Noirs. This is a dark Pinot Noir, with savoury aromas of forest floor, black cherry and chocolate. This is reminiscent of those red Burgundies said to have a barnyard note, something that Burgundy enthusiasts consider desirable. The flavours are savoury and herbal with a touch of cherry. The structure is still firm but evolving. I would recommend cellaring this wine another five years so it can blossom to its full potential. 88-90. D’Angelo Tempranillo Riserva 2009 ($19.90). The aromas and flavours of this big red reminded me of some big Spanish reds I have tasted. It begins with spicy blackberry and vanilla aromas. On the palate, there is blackberry, boysenberry, dark chocolate and vanilla, with a lingering finish of spice and vanilla. The texture is generous. 90. D’Angelo Merlot Cabernet Riserva 2009 ($22.90). The Merlot in this blend contributes appealing sweet berry flavours to this ripe and generous wine. It shows aromas and flavours of black currant, vanilla, chocolate and coffee. The wine benefits from decanting to liberate all of the aromas and tastes. 89. D’Angelo Sette Coppa Riserva 2007 Unfiltered ($24.90). The flagship red blend’s name, Sette Coppa, means “seventh measure.” This comes from the nickname of Sal’s great-grandfather, Donato, who persuaded the local flour mill to take every seventh measure as payment for grinding his grain when others were being assessed every sixth measure. You can see where Sal gets his shrewdness from! This wine begins with mint, vanilla and black currant aromas. Full-bodied, it tastes of black currants, coffee, dark chocolate and vanilla. The latter reflects the long, but not excessive, barrel aging that Sal gave to all of his big reds. 90.